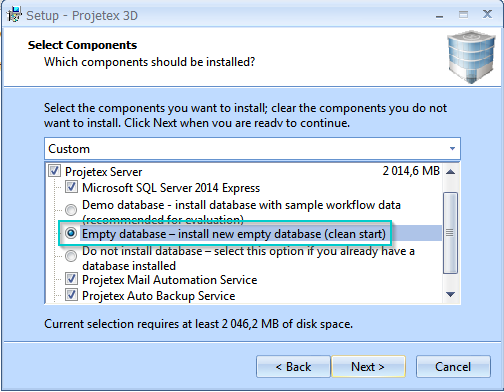 How to re-install Projetex with an empty database, if the demo database is already installed? The Projetex installer will never delete an existing database. This allows for the application of updates without the risk of losing data. 1) On the server machine, navigate to C:\Program Files (x86)\Microsoft SQL Server\MSSQL12.P3D\MSSQL and manually delete the "DATA" folder. 2) Run the installer, and select the "Server installation" and "Empty database" options.